The winter has surely arrived….bitter cold, gusty icy winds, driving snow across your face! I pretend that since I live in Chicago, I have to like it. Well I don’t. I can’t wait until Spring! Now we have had a rather mild winter compared to last year…but I long for Spring. So I am staying in and working on my PhDs! Yep…I have plenty of those! Projects half done. My IPhone was screaming for me to use it, so I finally took some photos. These projects big and small are like monkeys on my back screeching at me until they are complete. Number one monkey is a triple Irish chain that I showed you last post. 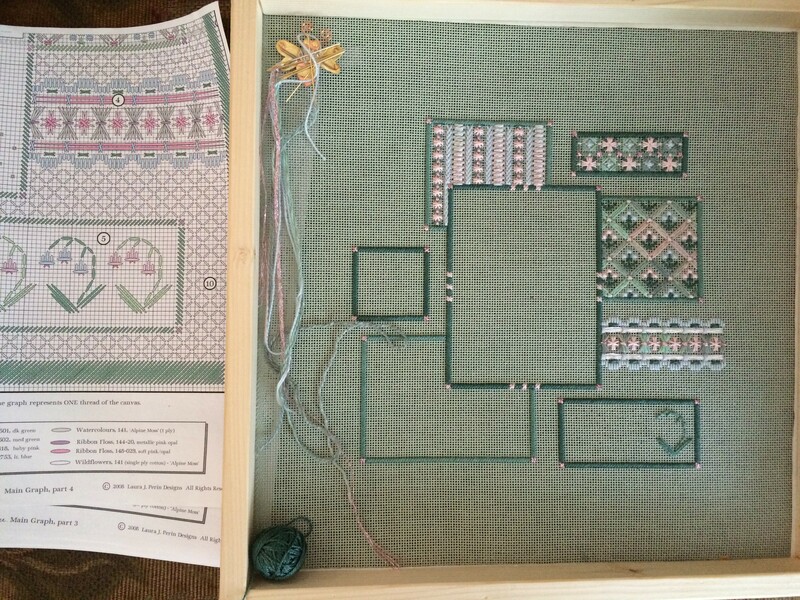 It took me six months to design and bring to fruition the border, get it layered and onto my quilt frame. I have a couple of friends who are helping me to quilt it, but so far we have only worked on it 9 out of 27 possible Fridays. Either I was away on vacation, someone else was away, the holidays came upon us, family obligations took precedence, or someone was ill. I have been diligently working on it in between our Fridays hoping to speed up the process. 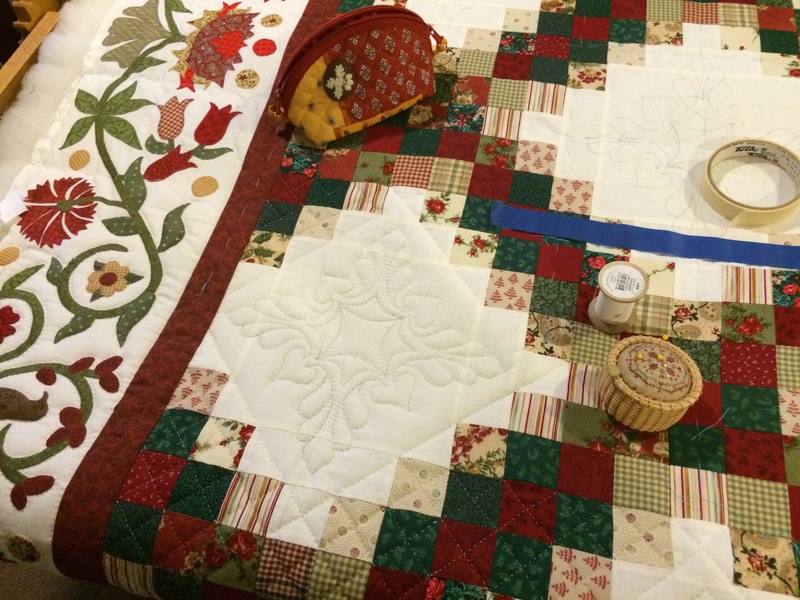 Lesson Learned: I absolutely adore this quilt (110″ x 110″) and I would make another one in a heartbeat; I adore the hand quilting even if it takes forever (truly heirloom); something is worth the time if you truly love it. Number two monkey is another HUGE (101″ x 101″) red and white quilt that I am machine quilting myself on my home machine (no long or mid-arms here). Crazy…yes. It is the pattern Saturday Soiree which I increased to make it larger. And now I am sick and tired of looking at the busy red and white pattern and can’t wait to have it done. 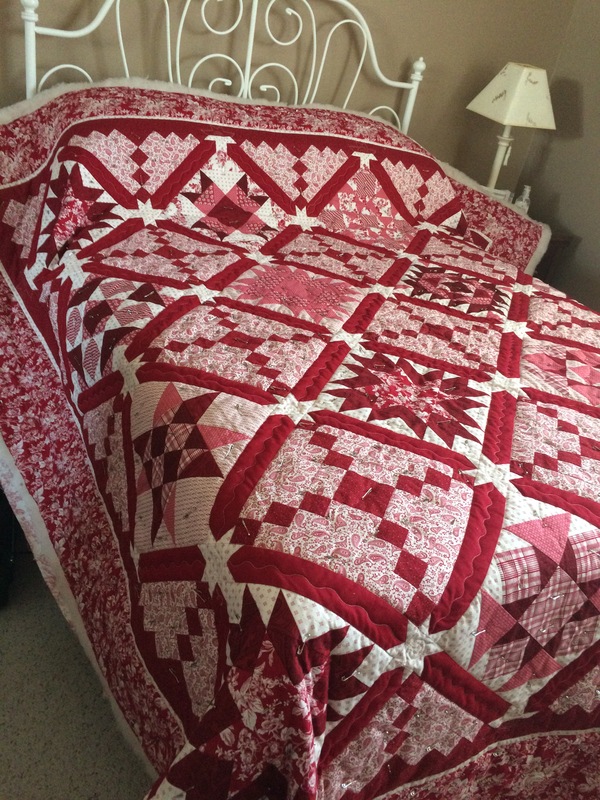 Lesson Learned: for me personally, I don’t like the block of the month thing; I love red and white, but only when it’s mostly white; don’t take on a huge quilt like this on a home machine unless you have a TON of patience. I am sorely lacking…but I keep on at it like the Eveready Bunny. And it is getting done and nicely if I do say so myself. Number three monkey is my Halloween Fairy. I saw a blogging friend doing this several years and ago and admired it so much I started one myself. My friend even donated to me her left over beads and some thread. I think I have been working on it at least four years or more. I totally stopped when it came to all the tiny beads. Now I have it on my kitchen island staring at me each day begging me to take an hour or so here and there and sew those teensy tiny beads on it. Progress is slow, but it is coming along. 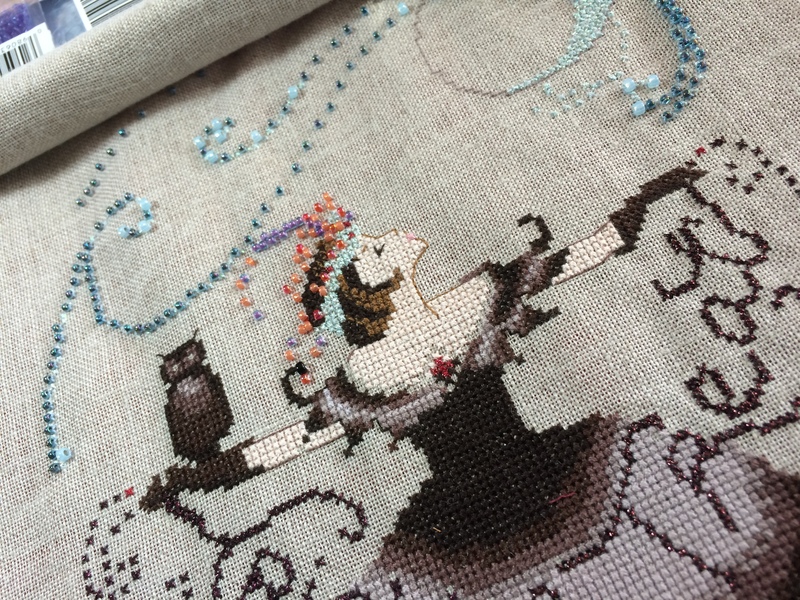 Lesson Learned: I won’t ever choose another cross-stitch with a zillion tiny beads; once you start a project do one’s best to finish it in a timely fashion….going back to it later makes the monkey seem like a gorilla! 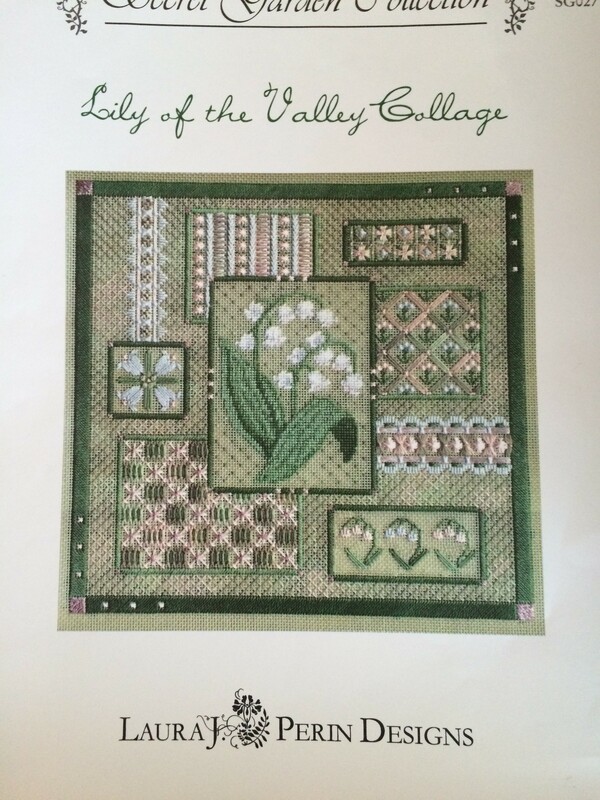 Number four monkey is my Lily of the Valley Collage by Laura J. Perin. I LOVE this design and looked at it for a few years before buying it. I am not much of a “canvas”/”needlepoint” person, but I thought I would stretch myself and tackle this one. I haven’t been working on this one for very long, but I have to push myself to work on it. Lesson Learned: It’s great to experience new types of stitching; teaches me patience when I have to struggle with the counting and stitches on the canvas; have a bit of eye coordination problem when I see light beneath the canvas; don’t stop…keep on keeping on; and always try new things. Number five monkey is a tiny ribbon embroidered pin cushion. 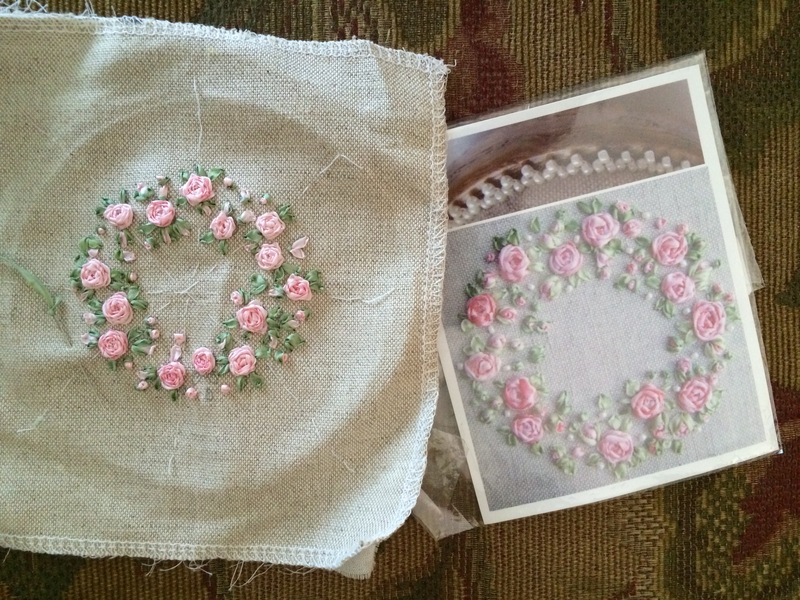 It is Roses and Pearls by Lorna Bateman. Now I simply adore this piece. I nearly finished it right away, knowing if I stopped it would never get done. Well, I stopped and left it in the bag and now nearly a year later I am committed to finishing it. It’s truly an easy project. So why isn’t it finished? Beats me. Lesson Learned: DON’T STOP. Do the little projects right away!!! And last but not least is my TAMED monkey. A very small Halloween project. 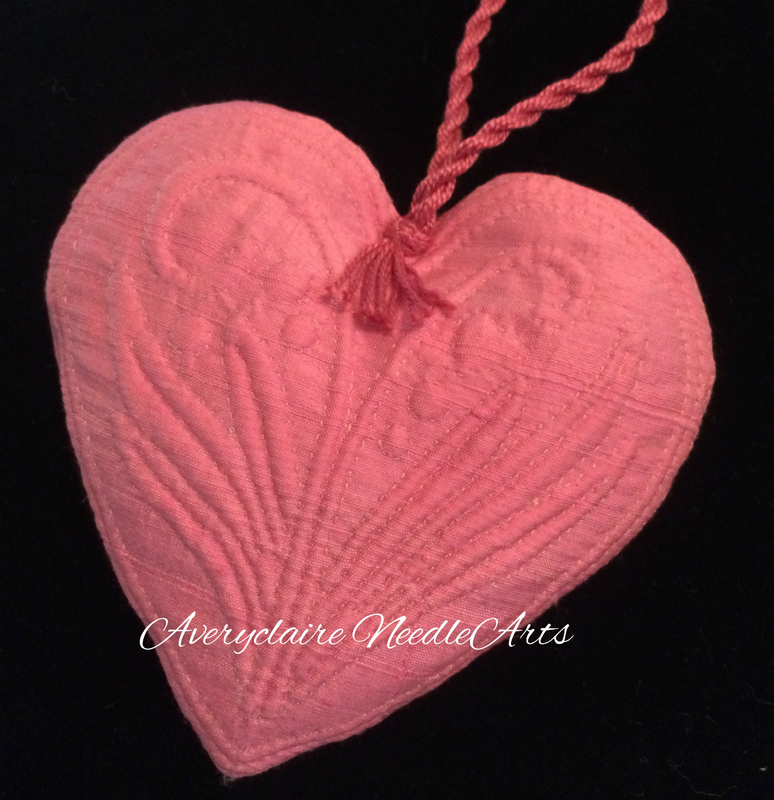 It was a give away item I picked up at one of my needlework groups when it was just screaming my name. 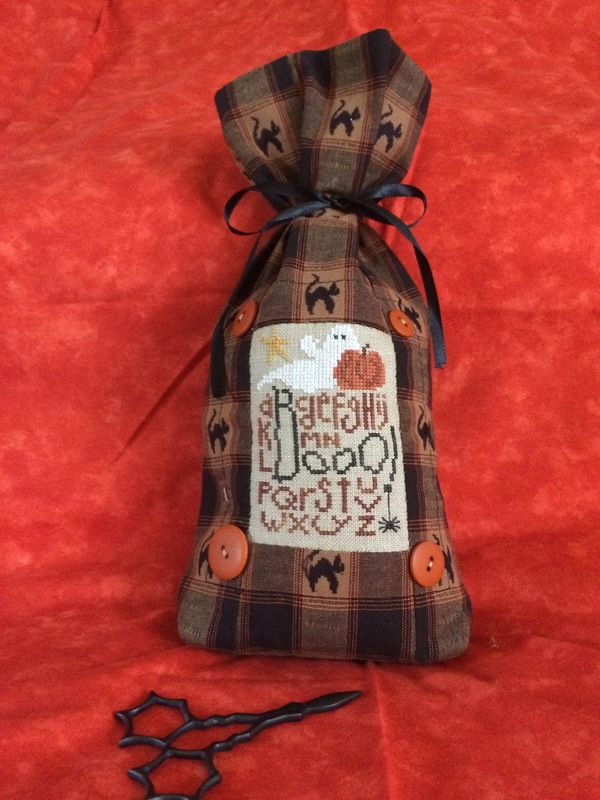 Left it lie around my stash pile until Autumn rolled around and I was looking for something Halloween-ish to work on. Such a small item should have been done in a weekend, but I spent a few months taking a stitch here and there. But voila! C’est complete! A last finish of the 2014 year. Lesson Learned: Little projects are great…do more of them; do them faster…they give you an IMMENSE feeling of satisfaction. MAJOR LESSON LEARNED: Remember to enjoy the journey no matter what. Honestly, I was thinking of you today….wondering what you are currently working on! Well I don’t need to wonder any longer! Beautiful work, Karen. Love you! 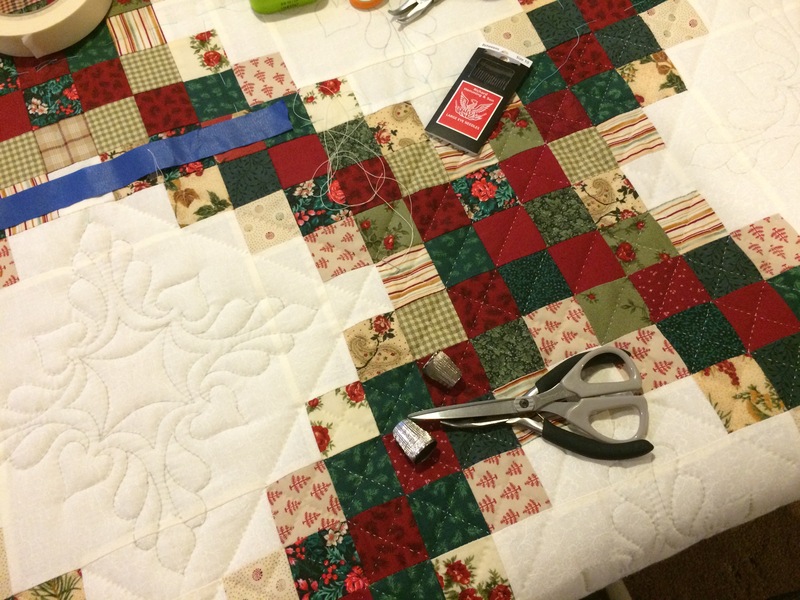 love all of the projects you are working on, those 2 quilts will be stunning when finished….a little bit at a time, goes a long way and you will be done before you know it! Hello Karen What beautiful work. You are so talented and have so much patience to do all this intricate work..I love the way you describe your unfinished work as PhDs. It was this time last year that we met through ‘Grow Your Blog’ i have the gift you sent me hanging in my summer cottage which is always admired by the guests who stay there.. So nice to see your work. I am always amazed at your talent! So many different projects, and all of them lovely! versatile. I love them all, big and small, quilting to x-stitch. Fun to read about your lessons learned. I’m all about smalls these days myself. I agree about the finish-finish satisfaction! I love all your projects. And a finish too! The quilt that you are quilting with your friends is my favorite. Talk about amazingly gorgeous! That border! Spectacular! I just love it! And I love that you and your friends get together to quilt it. I haven’t had a quilt in since before the kids were born. Oh, I do love this post with all theses monkeys and ‘lessons learned’. When you are back with your blogging, it is really for something like a show and tell. I’m a little behind in my blog reading this weekend, but I had to hop over here right away this afternoon because this morning you were The Talk of our end of the table at the Chicago ANG meeting. Everyone had read your blog post, even my friend Joyce (hangs head in shame), and they were all raving about what beautiful projects you create–because they are! Your quilting is majorly spectacular and your hand embroidery is divine! 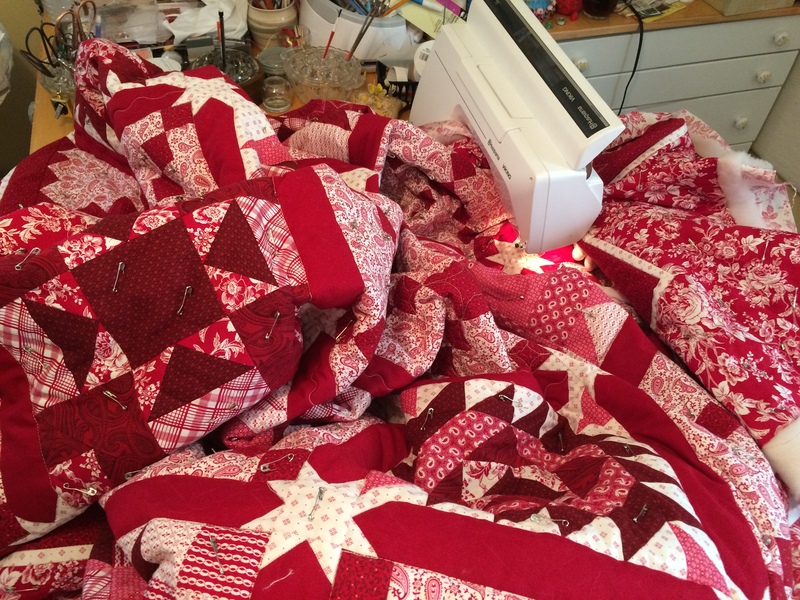 I loved the photo of your red-and-white quilt stuffed into your sewing machine! 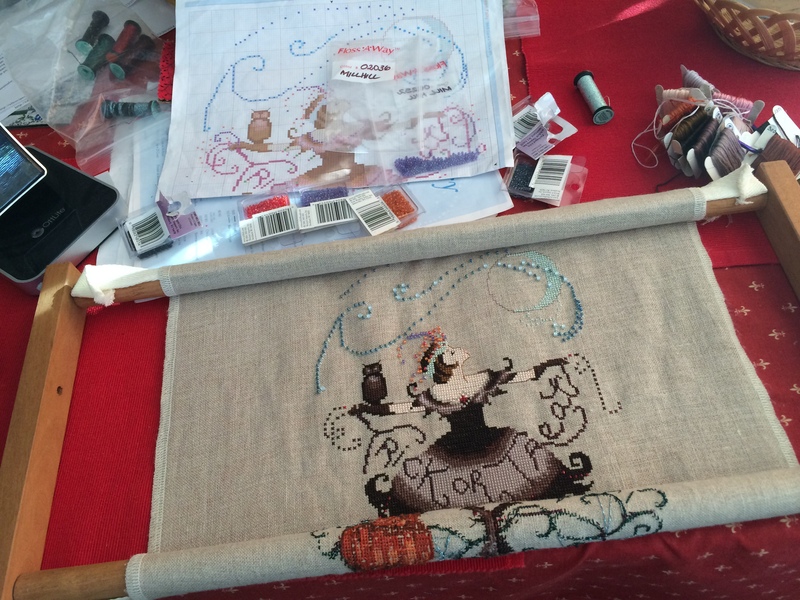 Keep on keeping on–you are really close to a finish with that ribbon pincushion. I love your “PhD” expression. And all I can say about your quilts and needlework is BEAUTIFUL! Lovely projects … all of them! And to top it off you have the perfect scissors next to the last project! The work of your hands and heart is amazingly beautiful! As to living in Chi-town, I had the opportunity and, thankfully wisdom prevailed, turned the job offer down.